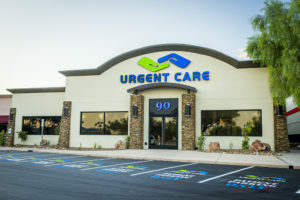 Southern Arizona Urgent Care (SAUC) has expanded its footprint with the recent opening of its third Tucson location, located at 90 W. River Rd. between N. Stone Ave. and N. Oracle Rd. Since its inception in 2012, SAUC has opened two premier locations in Oro Valley and has quickly become the healthcare destination of choice for anyone with routine or episodic healthcare needs. What started as a vision in the mind of founder and CEO, Dr. David Skinner, MD, PhD, MBA, a local Tucsonan and U of A College of Medicine graduate, is now the best urgent care in Southern Arizona. That is at least according to both Google and Yelp, where it is consistently the highest ranked urgent care in all of Tucson. Dr. Skinner personally oversees the design and construction of each building to ensure that each SAUC location delivers an unprecedented healthcare experience. With its top-notch décor, warm atmosphere, and relentless focus on patient satisfaction, there is no question that SAUC has the perfect blend of ingredients. SAUC is on the fast track to becoming Southern Arizona’s leading urgent care platform. With its fourth location opening this November in Marana at 3662 W. Ina Rd., and its fifth location opening on the northeast corner of Broadway Blvd. and Wilmot Rd., SAUC’s footprint will continue to expand with an additional seven locations opening in 2017. These 12 upscale and state-of-the-art urgent care centers will serve the entire Tucson Metro area and usher in a new standard of outpatient healthcare. Southern Arizona Urgent Care facilities are open daily from 7 a.m. to 7 p.m., seven days a week. They accept most major insurances and offer an affordable self-pay option. For more information and to check-in, visit the website at https://SAUC.com or call (520) 544-CARE. Real estate questions should be directed to Aaron LaPrise at Cushman & Wakefield | PICOR, 520-546-2770, [email protected].